A war of attrition is a military strategy in which one side tries to cause so many losses of soldiers and so much destruction of military equipment that it wears down the enemy forces until they collapse. The side with more resources (soldiers and military equipment) is the side that usually wins. Military experts like Sun Tzu say attrition is not the best way to win a war. A famous quote by Sun Tzu is "the supreme art of war is to subdue the enemy without fighting". In a war of attrition both parties think they can win. One is always wrong and often, both are wrong. They can both end up with fewer resources than when they began. Ideally, wars are won using the least numbers of soldiers and weapons possible. Another form of attrition warfare is the search and destroy operations used by the United States during the Vietnam War. That same conflict proved that wars of attrition do not work when your enemy is willing to absorb higher losses and continue a war indefinitely. Union General Ulysses S. Grant began a war of attrition with the Battle of the Wilderness. This was a change for the Army of the Potomac. No longer going after the Confederate capital at Richmond, Virginia, Grant was directly going after Lee's Army of Northern Virginia. It was the first battle of the Union army's Overland Campaign and ended with neither side victorious. The combined casualties totaled 28,000. Grant knew that although his losses were greater, any losses for the Confederacy would reduce their capacity to fight. The North had a much larger pool of resources to work with. So Grant concluded any Confederate losses were worth the sacrifice made by the Union army. 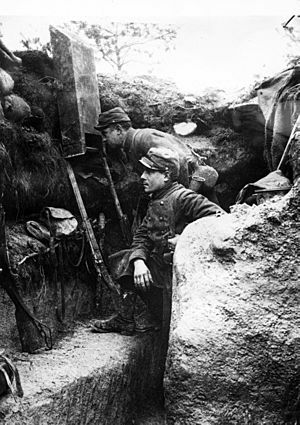 One of the best examples of a war of attrition is World War I on the Italian and Western Fronts. Both sides were drained until one side did not have enough men, horses, food and other military resources to continue. Attrition warfare Facts for Kids. Kiddle Encyclopedia.